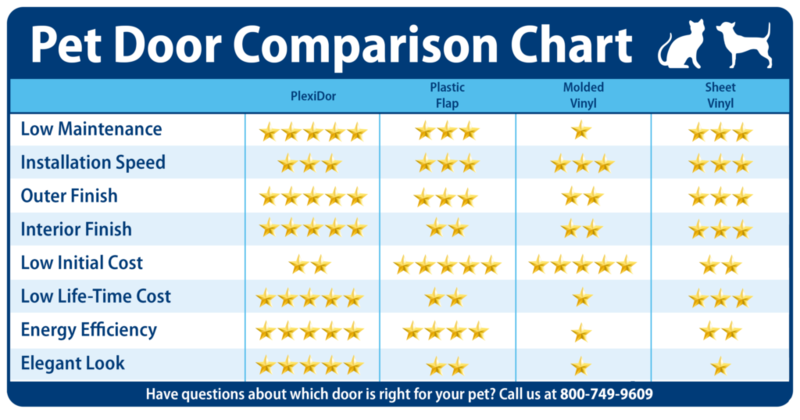 Which pet door material is the best? Plastic, Vinyl, K9-Composite – there are many pet door materials to choose from, along with a few different ways to construct the door. Which is the best depends on where it should be installed, what type of pet will use it, and how long it’s expected to last. This article will straighten some of the question marks, focusing on manual, residential pet doors – not kennel doors or electronic doors. A pet door frame is made from plastic or metal, and has two main purposes: attaching the pet door to the house door or wall, and holding the part that will open for the pet. Frames are made from plastic or metal. Plastic frames are low cost and can work very well for cats or gentle dogs. There is a risk that they’ll break or warp, and some dogs will chew them. Metal frames are sturdy and last for many years. A door with a metal frame will cost more to purchase, but will last longer than a door with a plastic frame. The flap is the part that opens. It can be made from plastic, vinyl, or K9-Composite. Plastic flaps are low cost. They’re made from PVC (Poly Vinyl Chloride) and generally mounted on a plastic frame. These doors last for about five years for cats and between two and five years for smaller dogs. The flaps are ridged and many doors have a pile weatherseal to help keep outside weather from affecting the indoor climate. Plastic flaps can work fine in snowy climates where the temperature doesn’t drop below 0 F (-18 C), but below this temperature, the plastic becomes brittle and cracks easily. If you only plan to be in your house or apartment for a couple of years, a plastic flap can be a good choice. The best installation is through a house door or with a window kit – making a hole through a wall is much more permanent, and for such a big installation it’s worth investing in a higher quality door. Doors with plastic flaps work well for cats and small dogs, but are not recommended for energetic breeds such as terriers and herding dogs, or large and powerful dogs. Charging through at full speed wears plastic flaps out, and the door will require service often. There are two types of vinyl flap doors. The Better Quality Vinyl Doors have flaps cut out from large sheets of vinyl. The material was manufactured in a controlled manner; cooled slowly in a process that allows the vinyl to normalize. That means the flap will hang true and not bend when the weather changes. These doors have magnets in the door frame and a piece of steel riveted onto the flap, allowing the door to stay shut. They function well in temperatures above 20 F (-7 C) but are not recommended for very cold climates such as Canada or Alaska. Depending on the pet, most owners need to change flaps every 5-10 years. These doors are excellent for households where a giant breed dog and a cat uses the same pet door. A door large enough for a 220 pound (100 Kg) dog is heavy, but the vinyl flap becomes light enough for the cat to open a corner at the bottom of the door. They’re also excellent for older dogs who are unable to lift their legs and jump through; the flap is so light that the dog can use an oversized door, mounted just an inch off the floor. Injection molded vinyl flaps are less costly to produce than the ones cut from large sheets. You can recognize these flaps through magnets embedded in the material. The manufacturing process makes them prone to lose their shape and many owners need to change the flap on a yearly basis. Thus, the door has a low up-front cost, but can become expensive in the long run. Pet doors with injection molded flaps work well in mild climates. If you live in an area with stable temperatures and no snow, this can be a good starter pet door. There are several brands making door units, wall units, and even patio panels with this type of flap, and they are suited for screen enclosures around patios. K9-Composite is an acrylic alloy created for pet doors – the material is similar to airplane windshields. These doors have a higher up-front cost than plastic or vinyl flaps, but they also last longer. The service life of a panel made from K9-Composite is 20-30 years. 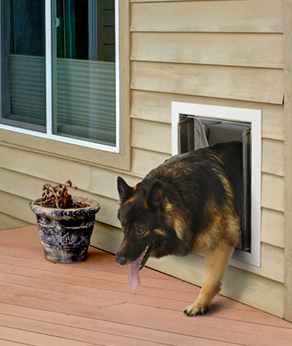 A pet door made from K9-Composite can withstand sunshine, cold weather, wind, and items hitting it at full speed. It is perfect for large or energetic dogs who will hit the door at full run, and the doors can even take a hard ball thrown at them without cracking. The temperature operation range is -50 F (-46 C) to 150 F (66 C), so this is the right door for extreme climates. The PlexiDor is the only brand using K9-Composite. The doors can be installed through house doors or walls, and the long life make them a good choice for permanent installations. The doors are perfect for very cold climates such as Canada, Alaska, Minnesota, and Michigan. These doors are not recommended for areas where the dogs or cats step directly onto sand.